In the fifth of PRWeek's series on voter-registration and turnout campaigns, we take a look at how, with several changes for voters to navigate in this year's local elections, South Lakeland District Council's comms team is focusing its efforts on getting them up to speed before they reach the ballot box. The 3 May vote is the first to reflect the reduction in the number of wards in the Lake District council from 45 to 18, which was enacted last year on the recommendation of the Local Government Boundary Commission. 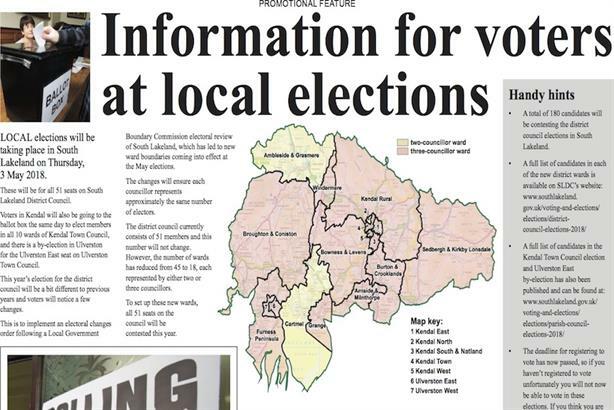 Voters are being warned not only that their ward and polling station may have changed, but also that there will be a bigger number of candidates to choose from than in previous elections. The challenge for the council’s comms team this year has been to maintain the area’s traditionally strong turnout levels despite the changes, according to communications manager Richard Machin. Turnout for the last local elections was just under 48 per cent, in an area where 33 per cent of the electorate is aged over 60 compared to the national average of 23 per cent. The success – or otherwise – of the council’s messaging will become clear on the day, Machin said. "If poll clerks are still getting lots of questions and confusion and this is replicated district-wide, then we know we won’t have been particularly effective… but if voters arrive at the polling station clear on how it all works, then we will consider our job well done." Efforts to encourage younger people to register to vote have taken a back seat to ensuring that the entire electorate, which numbers 83,739, "understands that things will look and feel a bit different this year". For example, two or three candidates, rather than one or two, will be elected in each ward, so voters will have a longer ballot paper containing up to 13 candidates. In addition, this election is on an all-out basis, rather than the recent pattern of a third of councillors standing for re-election in cycles. The council has been explaining the changes using all its available channels – web, in-house print, social media, traditional media and key partners. "We’ve tried to take what is quite a complex set of information and make it as easy to understand as possible. Video is perfect for this, so we’ve produced a ‘how-to’ video guide to be shared on our social media channels," Machin said.